Well, the stockings have been hung by the natural gas fireplace with care, and I have officially completed whisky Advent. Thanks to all those of you who have read along to date – I can quite confidently say that you will not be seeing a post on PnP tomorrow, so enjoy this one! The KWM Whisky Advent Calendar comes to a close with a bang, delivering the promised 40 year old dram in the form of Glenfarclas’ 40 Year Highland Single Malt. This scotch comes with a $720 price tag (actually a strong value for the age of the whisky involved) and with a number of critical accolades, having been hailed Whisky of the Year by Malt Advocate. 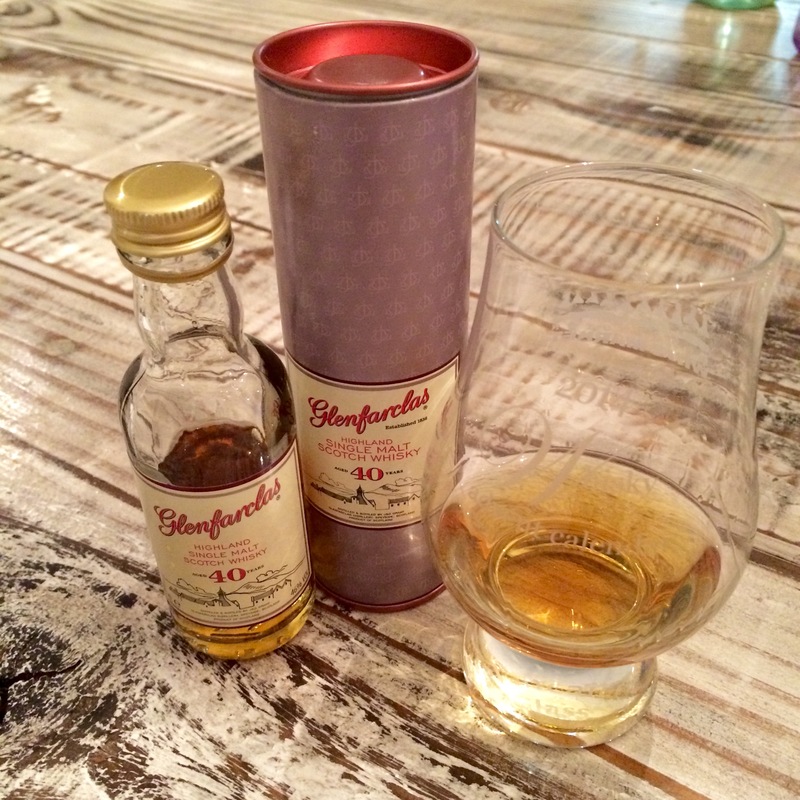 It’s Glenfarclas’ second appearance in the calendar; it previously tried to destroy your mind with its 60% abv bottling Glenfarclas 105 on Day 6. The one you’ve been waiting for. First calendar whisky older than me. The GF 40 certainly delivers, albeit not in a way that will embed itself on your psyche for years (or even weeks) afterward. It is a deep amber in colour, although not deep enough to immediately give away that it has spent four decades in a barrel. The aromas are mellow and meandering, maple syrup and marzipan, smoke, apple cider and Meyer lemon. It is soft and warming on the palate, opening up discernibly with a couple drops of water and featuring a complex yet subtle array of flavours: honey, vanilla and florals, orange zest, green grapes, dark rum and a dry heated wood note I can best describe as “sauna”. It isn’t life-changing, but it’s extremely well put-together, an experience to drink if not a lasting memory. I powered through this write-up a bit to leave time for some closing calendar thoughts (while still allowing me to ensure that Santa visits my household tonight). After 24 whiskies in 24 days, I feel like my appreciation for whisky and my understanding of regional distinctiveness and the impacts of distillation and maturation choices have increased exponentially. This has been a hugely valuable experience, and I can’t heap enough praise on Andrew Ferguson and Kensington Wine Market for putting it all together. Looking back at my various reviews this month, if I had to choose a Advent Whisky Top 3, it would be (in reverse order): #3. Big Peat, Day 5 (obviously not as stately as a 40 year old dram, but a sheer joy and a very pleasant surprise); #2. Bowmore 18, Day 17 (not quite Port Ellen, but a reasonable facsimile); and #1. GlenDronach 21 Parliament, Day 22 (still thinking about this two days later – just exquisite). Tonight’s ultra-premium dram would rank in the top 5, if you’re wondering, but I never seriously considered bumping it onto the podium, due partly to its price tag and partly to its inability to leave a lingering emotional impression. More Internationals: Obviously Scotland is the spiritual home of whisky, but the global whisky scene has become a much more interesting place in the past few years. This year’s calendar featured 23 scotches out of 24 whiskies, with the lone black sheep coming from Ireland. I’d love to see Japan, Taiwan, and even India show up in next year’s edition. Less Duplication: I’m guessing it’s hard to put together a calendar like this because it’s hard to find variety in higher end 50 mL whisky bottlings on the market. I’m also guessing there are regulatory/AGLC reasons that would prohibit KWM from creating its own mini-bottles out of the plethora of full bottle options in its shop. But the calendar would be vastly improved if no distillery got double representation, and three-peats (no scotch pun intended) should be right out. Spread The Wealth: I get the marketing pull behind being able to say you have a 40 Year whisky somewhere in the calendar, but I think the overall product would be much improved by skipping the ultra-expensive one-off and redistributing its cost throughout the rest of the lineup. I would definitely pass up the $720 bottle if it meant increasing the average value of every other bottle in the calendar by $20-$25. All that said, I hugely appreciate all the work it must have taken to put this thing together, and I can emphatically confirm that it paid off. Merry Christmas everyone! !